What does it mean for a planet to be at opposition? From our Earth perspective, the Sun and the planet are in opposite directions in the sky. The moment the Sun sets in the west, the planet rises in the east. 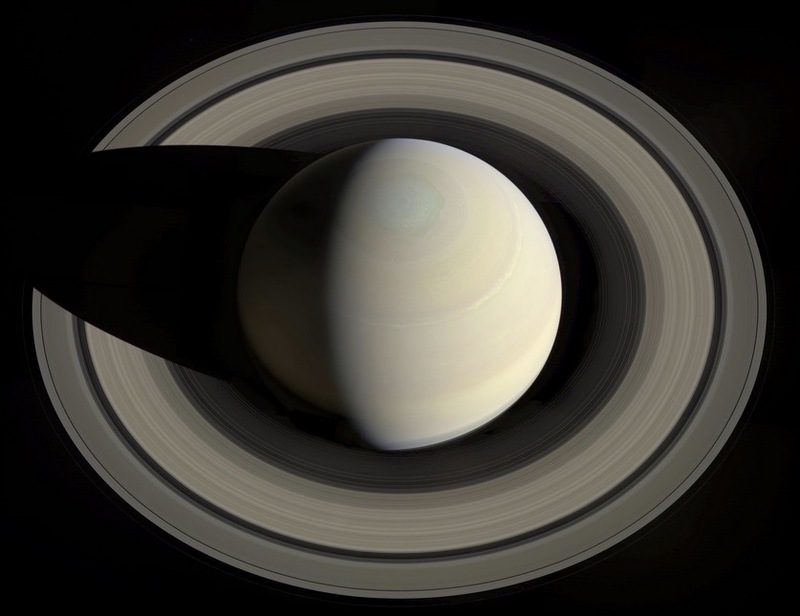 Saturday May 23 is opposition day for Saturn. The illustration below shows a thin yellow line from the Sun through Earth to Saturn. Visit In-The-Sky.org to play with the interactive for this image. There are two astronauts somewhere in space, 3 meters apart, and not moving relative to each other. Astronaut Lucy has a total mass of 100 kg including her suit. Astronaut Ricky has a total mass of 140 kg including his suit. Question 1 – Is there a physical attractive force between them? Question 2 – What are the variables which affect the strength of that force? Question 3 – How large is that force? Those questions will be answered in this post. Saturn is one of the most beautiful objects in the night sky. Anyone who has viewed it through a telescope probably remembers the moment. I have shown it to many people through my telescope. It is fun to hear them exclaim about it. Young and old alike are moved by that experience. The feature people enjoy the most is the ring structure. They were first observed by Galileo July 30, 1610. Although, he did not describe them as rings. Instead, they appeared to him as two separate and nearby bodies on either side of Saturn in this arrangement oOo. The spacecraft Voyager 1 and 2 in 1981 and 1980 passed near the rings and gave us the most astounding views up to that time. The detail was amazing. The views captivated our imaginations and prompted scientists to plan space missions to investigate further. This image below shows the main features of the ring structure. The third part of the Lunar Eclipse Tetrad takes place just before sunrise on April 4, 2015, low in the western sky for us in the central U.S. For observers in the eastern time zone of the U.S., they will not see the total eclipse phase. The Moon will set before it begins. They will see some of the partial eclipse phase. Those of us in the central time zone will see the total eclipse phase just as the Moon sets in the west. Observers farther to the west will be able to witness more of totality before it sets. The best location is Hawaii except that you need to observe in the middle of the night. 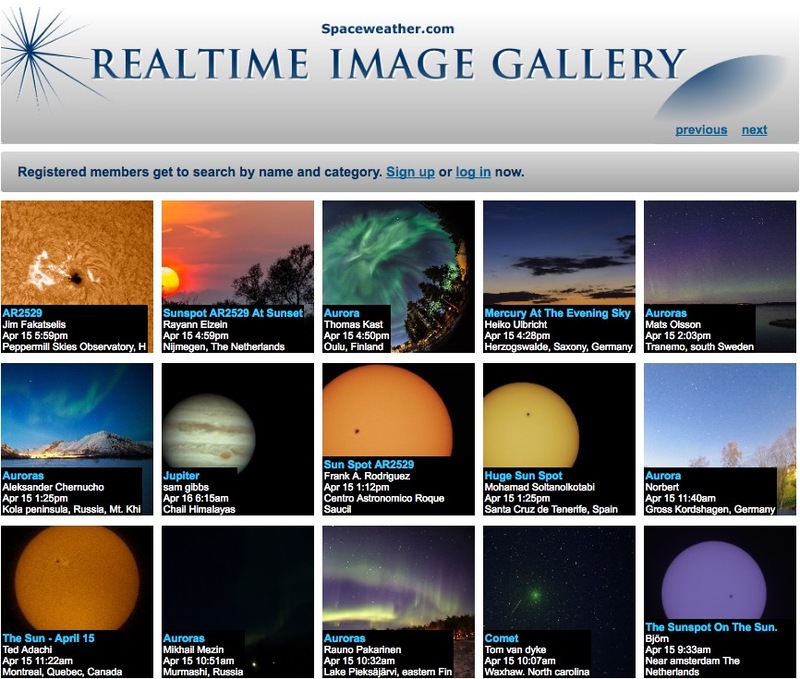 I prepared a video with my desktop planetarium software of the view to the west horizon for my location in Iowa. The time covered is from 5:10 am until a few minutes after 7:00 am. Note that the Moon will set at the same time that the Sun rises. This can only happen during a total lunar eclipse because of their alignment with Earth. There is a high quality glass prism sitting in a south window of our living room. 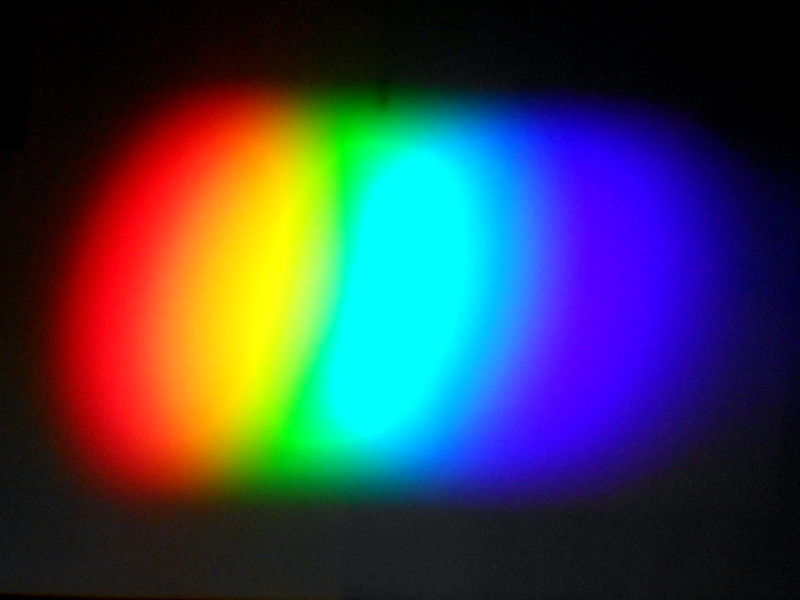 Every sunny day it casts a rich full rainbow spectrum on the wall across the room. Briefly, it shines in a dark place 30 feet away. 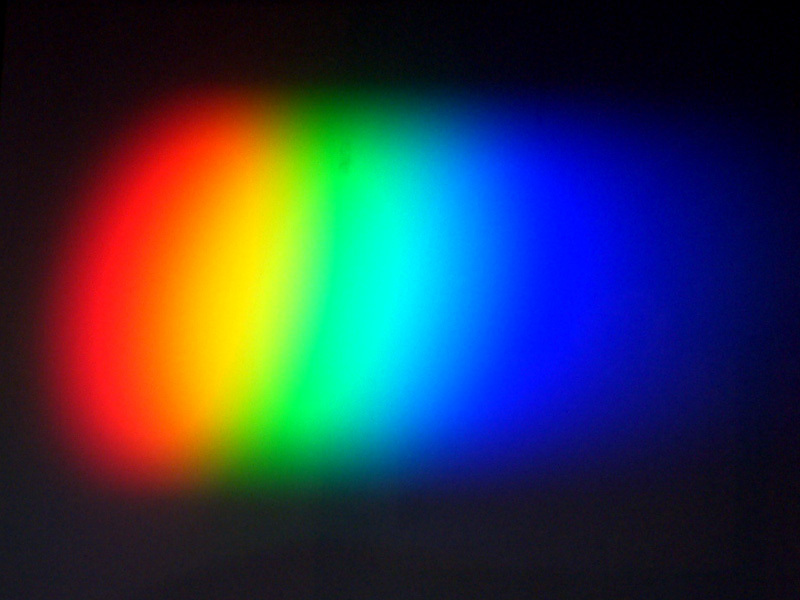 The red–orange–yellow–green–blue–indigo–violet of that distant spectrum stretches 6 inches end-to-end. It is like a colorful clock passing time as it moves through the house. Do different digital cameras see colors of the exact same object identically? 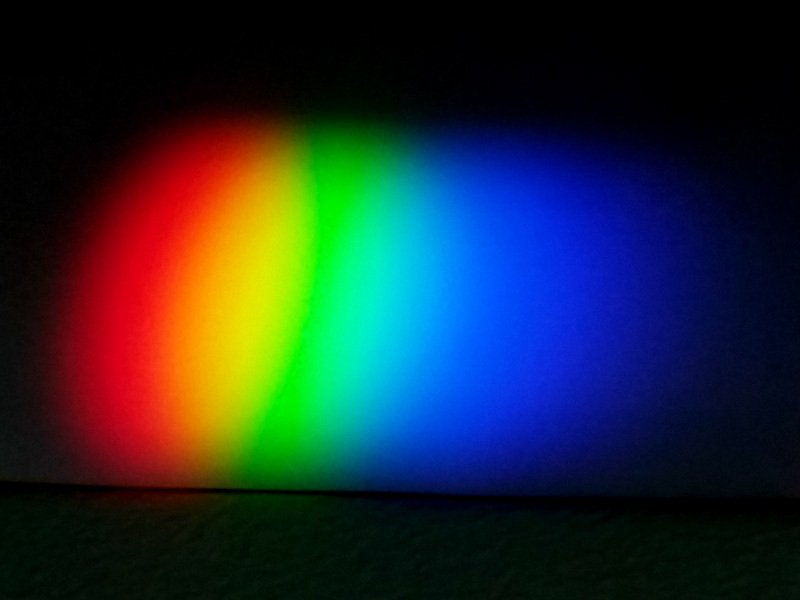 Today, I placed a sheet of white paper on the wall where the spectrum was to pass. I gathered my three cameras to get a photograph of the spectrum with each when it was on the white paper. All images were done at the same location and magnification as near as possible. The first is the oldest camera from 2002: Fujifilm FinePix S602z. Second is a compact camera from 2012: Nikon Coolpix S3300. Third is the newest and a camera phone from 2014: Samsung Galaxy S5. Each image was adjusted to set the surrounding dark area to black. No other adjustments were made. The first two cameras show pronounced regions of red, green, and blue showing as distinct ovals. The third does not have those clearly defined ovals. Most consumer cameras use light sensors that convert light to electric charge called CCDs Charge Coupled Devices. A 3-colored filter of red, green, and blue is placed over the CCD to capture the components of color in the scene. If the neighboring pixels in the CCD all gather a lot of red, green, and blue, the location is rendered as white. If only red and green, then the location is yellow. Blue and green give cyan. Most cameras have algorithms to compute the values of the neighboring locations on the CCD and blend them together into pleasing and accurate renditions of the colors of the scene. Some cameras are better at this than others. The first one above is better at that than the second one. The third camera from the phone does the best job at this of the three. The image looks nearly identical to what my eyes saw. The blending is very smooth with no excessively bright regions. The colors are true. Different digital cameras do not see colors of the exact same object identically. All spacecraft in low Earth orbit (above 160 km or 99 mi) experience some drag force on their motion. The drag forces are smaller if the spacecraft is several hundred kilometers above the surface. These forces cause the spacecraft to gradually slow down and lose altitude. In time, they re-enter the atmosphere, heat up, and burn. If the surface area of the spacecraft is large, this process of orbit decay is speeded up. In order to keep the spacecraft in orbit for longer mission time, a way is needed to reboost the speed and gain altitude. Some spacecraft carry rocket engines on board for that purpose. That adds weight and expense. The International Space Station is a huge spacecraft. It is larger than a soccer field as illustrated below. It has as much living space as a six bedroom house in the cylindrical modules near the center. The solar panels add a large surface area and drag force. At an altitude of 400 km, it needs periodic reboosts to raise it back up. They occur every 3-6 weeks on average. This post describes how the reboosts are done. SHOW ME HOW IT IS DONE. UPDATE: May 25, 2014: It seems the shower was but a sprinkle of possibly 5-10 meteors per hour. As with some other events of this type, the media and social media hype far exceeds anything the true event could produce. But, it was a nice night for being out under the stars. Astronomers are predicting a new meteor shower the morning of May 24th for North America. 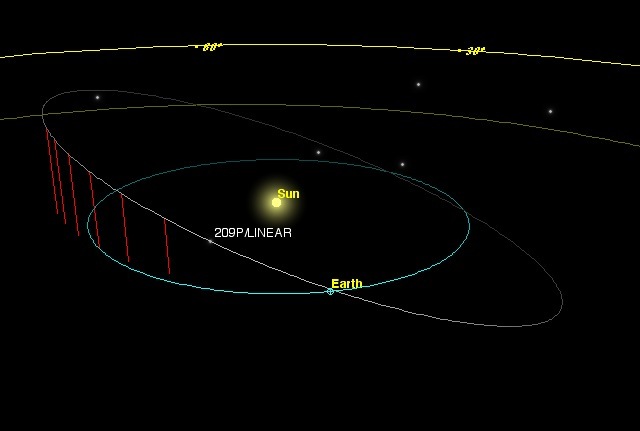 Comet 209P/LINEAR was discovered February 3, 2004 by Lincoln Near-Earth Asteroid Research (LINEAR). It has an orbital period of 5.1 years. At the farthest point from the Sun, it is nearly as far away as the orbit of Jupiter. At the nearest point, it is as far as the orbit of Earth from the Sun. Meteor counts of 100-400 per hour have been predicted by some astronomers. Some say there is a chance for up to 1000. No one knows for certain. This will be the first time Earth passes through the debris in the path of this comet. I recorded this desktop simulation of the orbit of the comet intersecting the orbit of Earth to give a sense of perspective. 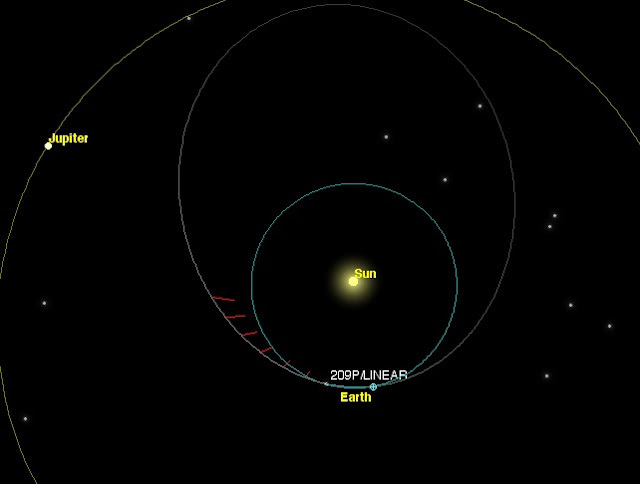 The plane of the orbit of the comet is inclined about 22˚ to the plane of Earth’s orbit. We are expected to pass through the debris left on some of the previous passes of the comet in our neighborhood of space. No one knows exactly how much debris we will encounter. If we are lucky, it might be a large amount that could produce some beautiful meteor streaks from north to south. Here are two frames from the video for you to get a better look. The first is an oblique view. The second is from directly above. 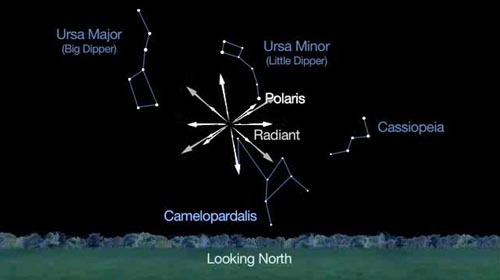 If you are fortunate to have clear skies where you live, look to the north for Polaris as depicted in this graphic from Space.com. The meteors are to radiate from the constellation Camelopardalis, the Giraffe, near Polaris. Note the location of the Ursa Major (Big Dipper) to the left and Cassiopeia to the right. This view is for the early morning hours of Saturday May 24th. NASA released this excellent video summarizing the event and the best times to view it. I invite you to watch the 3 minute video. Let’s all hope for clear skies that morning. Set your clock. Chances are good you will see some meteors. It is is possible you will see something spectacular. Don’t risk missing it. Here is one more special treat…the Moon occulted Saturn May 14 as seen from New South Wales in Australia. Thank for the video on Vimeo by Colin Legg. Capture from 20 km north of Albury, NSW. I missed egress in February, so nice to get it this time around. Egress sequence centred around 10 pm Australian EST. The moon was higher for egress than ingress so seeing was better. Equipment: Celestron C8, f/10, prime focus. Canon 5D2, running Magic Lantern RAW video firmware in 3x crop mode @ 1920 x 1076 resolution. 1/60 sec exposure, ISO 100, 16 fps.